I attended Congress in Accra in August 2018, as a job share International Board member of the UK section. I was one of the five UK delegates. Congress was a fantastic opportunity to meet with members from other National sections and groups as well as WILPF International staff, and to learn about how WILPF as an organisation actually operates and works. As the political and social situations that we live in are all different, challenges can sometimes be posed in terms of us all working together harmoniously. However, it was my overall impression that WILPF UK delegates had an invaluable experience at Congress and we all had something to bring back to our section, such as contacts and networks to build on along with inspiration and ideas for possible future activities. 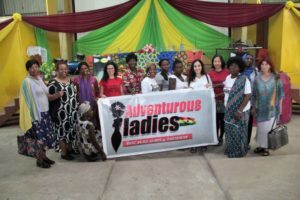 An additional highlight of our trip to Ghana was meeting after Congress with women from an inspirational women’s group based in Akuse, 70km north-east of Accra called Adventurous Ladies: Bold Step Quality Decisions. 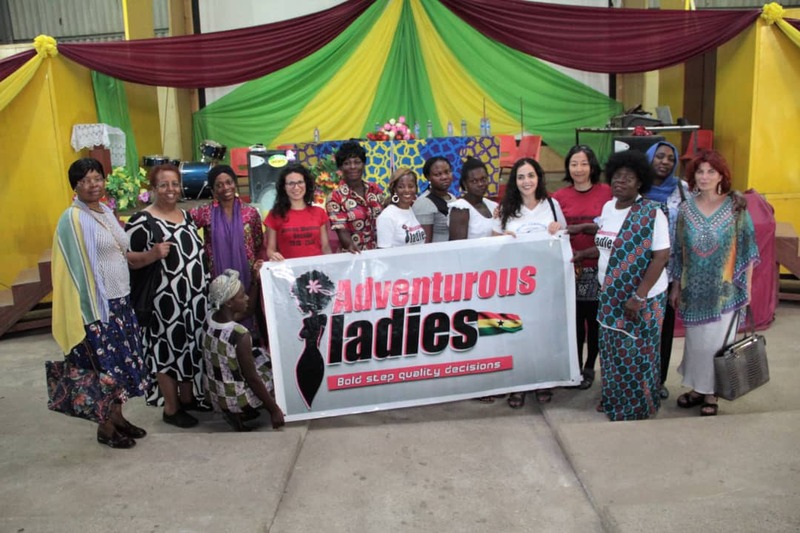 We were introduced to these women by Pat Boadu-Darko, a WILPF UK member and pbdTravel International, currently based in Akuse. 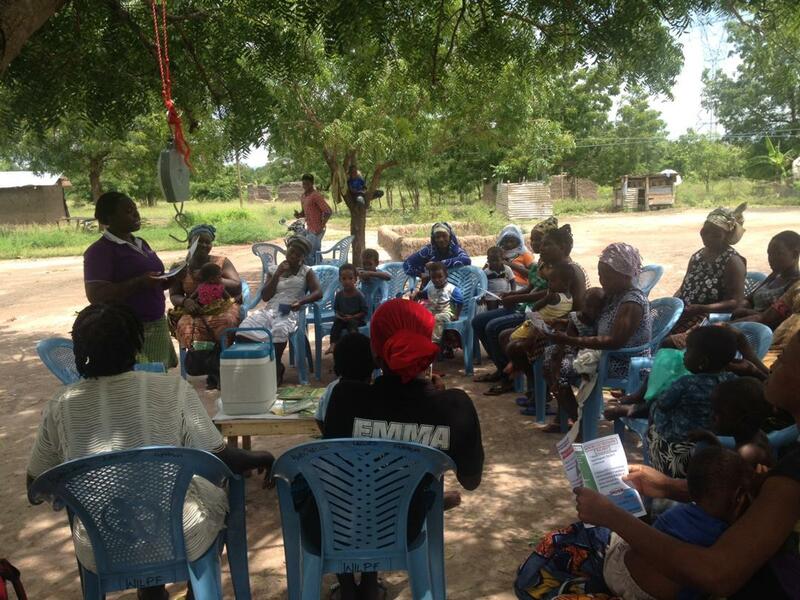 We learned from Pat that one of the projects that they are currently working on is to build a shelter with chairs for mothers and babies who come to receive their postnatal care. Mothers walk all the way from their home villages under the boiling sun to an open place where a nurse from Akuse Government Hospital visits, carrying their babies on their back and a chair on their head. The cost of a chair is 20 GHS (5 USD), and during Congress we asked for a small donation from delegates, and thanks to their generosity, we managed to raise an amount equivalent to 26.5 chairs. with an extremely warm welcome. 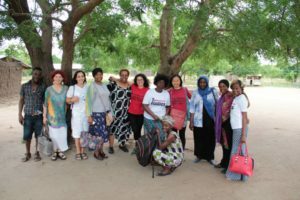 We presented the donation from WILPF members, and after short informal exchanges with the group and a photo session, we toured the village to see the area out in the open where postnatal care is provided to mothers and babies. We all left Akuse enthused and energised, but with some reflection on what security means for women in different contexts. 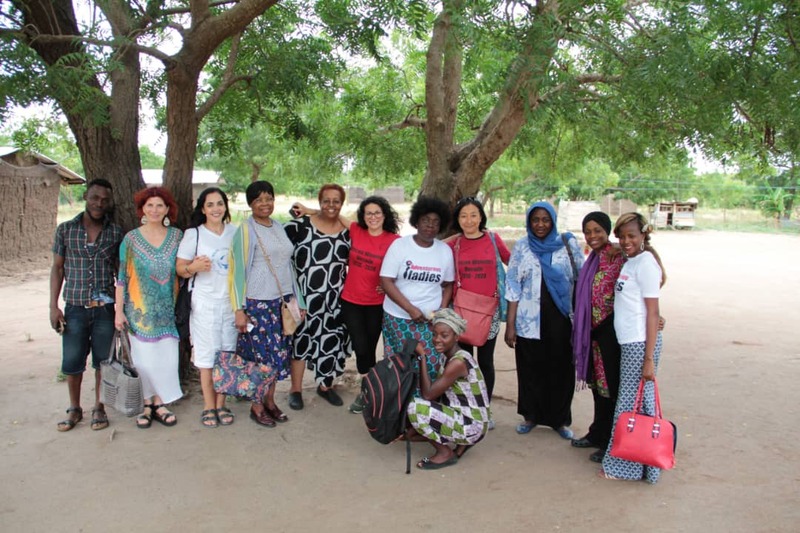 During Congress, a WILPF Ghana member also kindly offered to donate her children’s clothes. These were later collected by Pat and delivered to the Adventurous Ladies, and were very much appreciated. In September, we were informed that the chairs have been purchased and are in use, meanwhile now they are preparing for building a shelter. I am hoping that we will continue to support and be inspired by these women. Recently, Pat briefly came back to visit her family in the UK. With her initiative, we are planning to have a meeting with the Ghanaian High Commissioner to emphasise the importance of promoting women’s rights and gender equality.